This easy and cheesy crock pot mac n cheese will be a new family favorite that will be requested at all of your family gatherings. So simple and yet so delicious, you will want to make it again and again! Ever since I was I was a little girl, I have always loved homemade macaroni and cheese. It all started at my Aunt Brenda’s house where she would host Thanksgiving for the whole family and whoever else was lucky enough to show up. Everyone loved her cooking and Thanksgiving was her time to shine. She would make almost everything from scratch like yeast rolls, stuffing, and an assortment of other delicious sides as well as her famous pies for dessert. While she was cooking my sister and I would sneak into the kitchen to steal chunks of the extra sharp cheddar cheese she was slicing to make her famous mac n cheese. We would eat as much as we could get our hands on and have always enjoyed this cheese ever since thanks to my Aunt Brenda being preoccupied with other dishes long enough for us to sneak a few chunks. I recently spoke to my Aunt Brenda and found out that she knew every year that we were sneaking in to steal her cheese and she actually bought an extra block each year just for us. She said that she would hear us coming in to the kitchen and would turn her back just in time so we would feel like we were getting away with something. She is one of the sweetest women I have ever known and every time I see a block of Extra Sharp Cheddar Cheese, I think of her. Since this dish was one of the highlights of my childhood I decided to recreate it but I wanted to make it in an easy way that allows me to free up the other burners on Thanksgiving Day, so I created a Crock Pot Mac N Cheese recipe that rivals Aunt Brenda’s cheesy mac n cheese. It’s really simple to make and after boiling the elbow macaroni for about 5 minutes, you just throw the rest of the ingredients into the crock pot and get busy cooking other stuff because it’s really that simple. Just be sure to stir occasionally. If you are like me and don’t have time to watch the pot, pick up this CROCK POT THAT STIRS ITSELF, this is one of the best purchases I have ever made! If you have left overs that you would like to reheat, add a small amount of milk before reheating to prevent the macaroni from drying out. Also if your macaroni and cheese is too thick, add a little more milk and stir. This Crock Pot Mac N Cheese is my favorite Thanksgiving side dish to make for the holidays as well as throughout the year and it looks great served in this beautiful serving dish. What is your favorite recipe to make during the holidays? Boil the elbow macaroni for about 5 minutes to soften noodles. Add to the crock pot. Cut the Extra Sharp Cheddar Cheese into cubes or small chunks and then add to the crock pot. Add the milk and stir all ingredients. Cook on low for about 2 and a half hours. I'm going to do this, this year! I'm always wanting to find ways to serve great food, but save on time and space. Thankfully we just moved and have two ovens and a six burner stove, so its not as vital, but still any space and time you can save is good space and time!! Love it!! I love some yummy homemade mac and cheese!! I need to try this recipe!! Macaroni and cheese is a staple in our house. Sadly I have never had it homemade. This recipe looks really easy to recreate. I may just give it a shot. Oh my goodness! I've missed making mac n cheese by myself. I'm craving for this and I'll make it today. This looks so delicious and easy to make. I am always looking for new crock pot recipes to try. 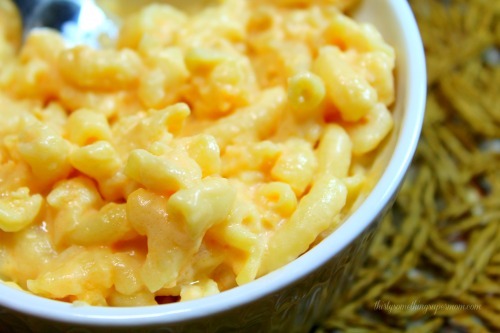 Mac & Cheese is one of my favorites. I have to give this recipe a try. I'm sure my family will love it. My boyfriend and I were JUST talking about making Mac n Cheese (but not the boxed stuff!) and I'll have to share this with him! We didn't even THINK of the crock pot! This recipe sounds amazing. I never thought of making mac n cheese in the crockpot. I will have to give it a try. Slow cookers are kind of my favorite. They are such an easy way to cook on a busy day! Love meal planning with my crock pot!